The International Conference on Social Identity and Health will be hosted in 2018 (July 12-14) at the University of Lausanne in Switzerland by the National Centre of Competence in Research (NCCR) LIVES. 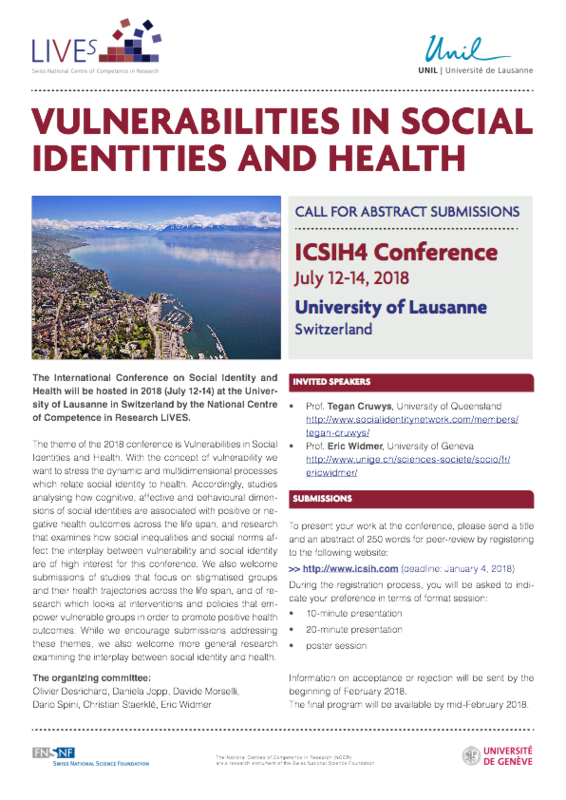 The theme of the 2018 conference is Vulnerabilities in Social Identities and Health. With the concept of vulnerability we want to stress the dynamic and multidimensional processes which relate social identity to health. Accordingly, studies analysing how cognitive, affective and behavioural dimensions of social identities are associated with positive or negative health outcomes across the life span, and research that examines how social inequalities and social norms affect the interplay between vulnerability and social identity are of high interest for this conference. We also welcome submissions of studies that focus on stigmatised groups and their health trajectories across the life span, and of research which looks at interventions and policies that empower vulnerable groups in order to promote positive health outcomes. While we encourage submissions addressing these themes, we also welcome more general research examining the interplay between social identity and health. To present your work at the conference, please send a title and an abstract of 250 words for peer-review before 4 January 2018 by registering to the following website: www.icsih.com. During the registration process, you will be asked to indicate your preference in terms of format session: 10-min presentation, 20-min presentation or poster session. Information on acceptance/rejection will be sent by the beginning of February 2018. Invited speakers are Tegan Cruwys (www.socialidentitynetwork.com/members/tegan-cruwys/) from the University of Queensland and Eric Widmer (www.unige.ch/sciences-societe/socio/fr/ericwidmer/) from the University of Geneva. The final program will be available by mid-February 2018.